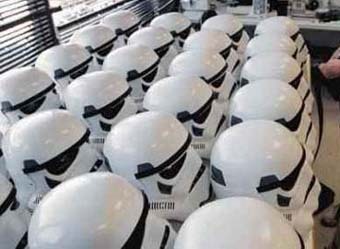 The Special Addition Stormtrooper Helmets and Armor are extremely similar to the Return of the Jedi versions - and therefore quite different from those in A New Hope/Empire Strikes Back. 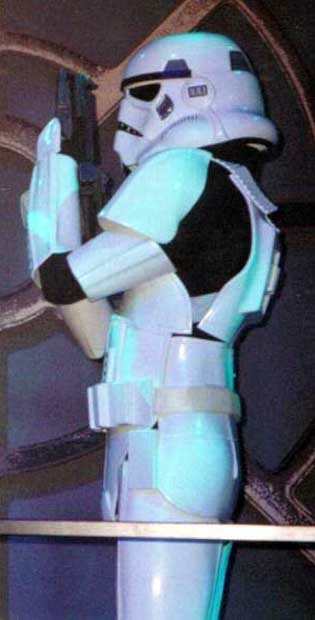 However, in the 1990's when Lucasfilm was making the SE versions of ANH and needed some additional troopers adding into certain scenes (such as when the Droid ring is found near the escape pod on Tatooine, and Luke and Ben's entrance into Mos Eisley), they just added RotJ Troopers (and at times CG versions of them). Therefore if you look hard you can see the clear differences - not least the black Vs Grey frown. 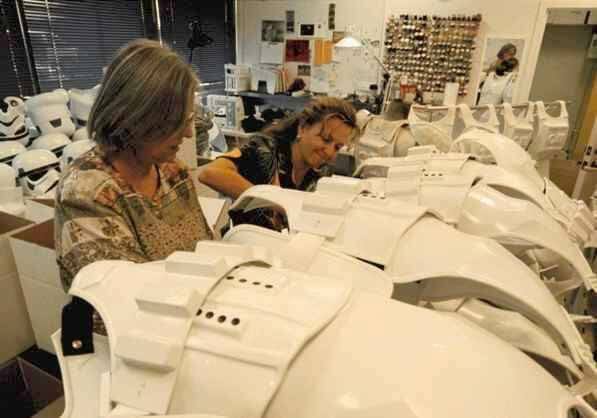 Finally some behind the scenes images from Anson featuring shots of the production of some trooper helmets for the special edition versions. I've just added this shot below which is better than the one above as it shows the colour variation between the new SE face (in his hand) and the RotJ helmet on the desk which would have been over 13 years old at this point. 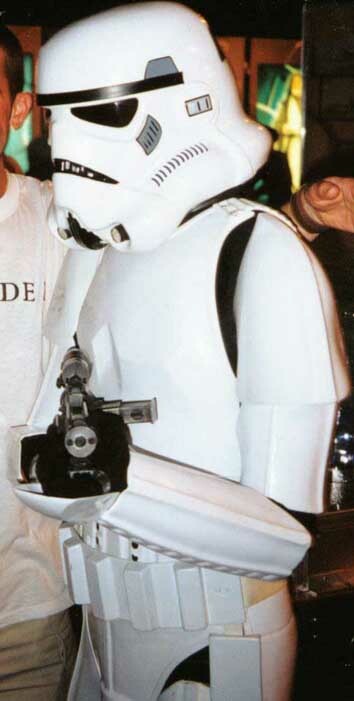 Below, here's a nice full-length shot of the SE trooper from the Dorling Kindesly book. 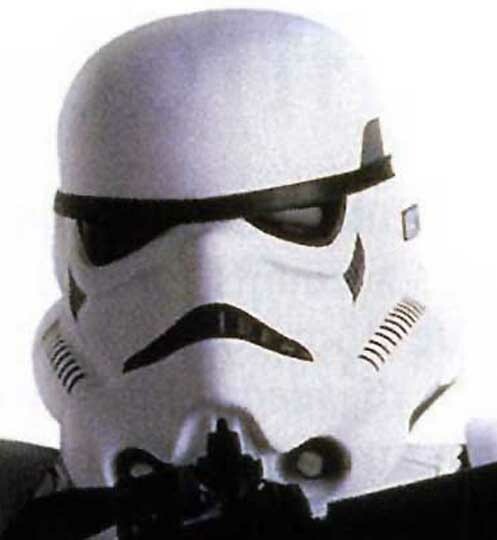 From a continuity perspective it was very strange that these troopers were used in the SE editions of ANH, despite the clear differences in head shape and the colour of the detailing. ...and as good as I can get it a close up of the SE helmet. 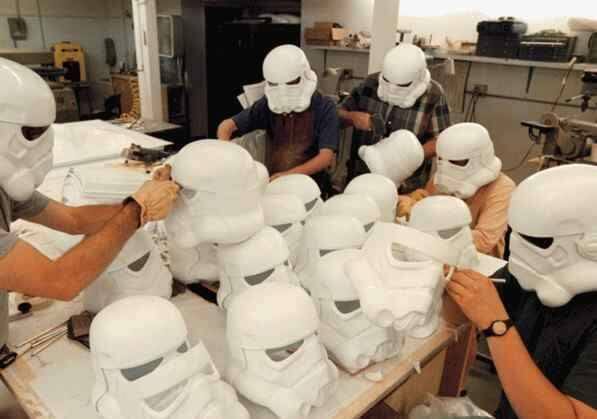 There were a total of 18 Darth Vader's made for the Fox marketing campaign of 1995, and I believe 32-36 Stormtroopers made. Fox needed so many for different campaigns around the world, so they were sent off to places such as Australia, the UK, Italy, Spain, France, Mexico...A manual created by me accompanied each set (One Vader and Two troopers), explaining sizes of actors, how to dress, and how to act. 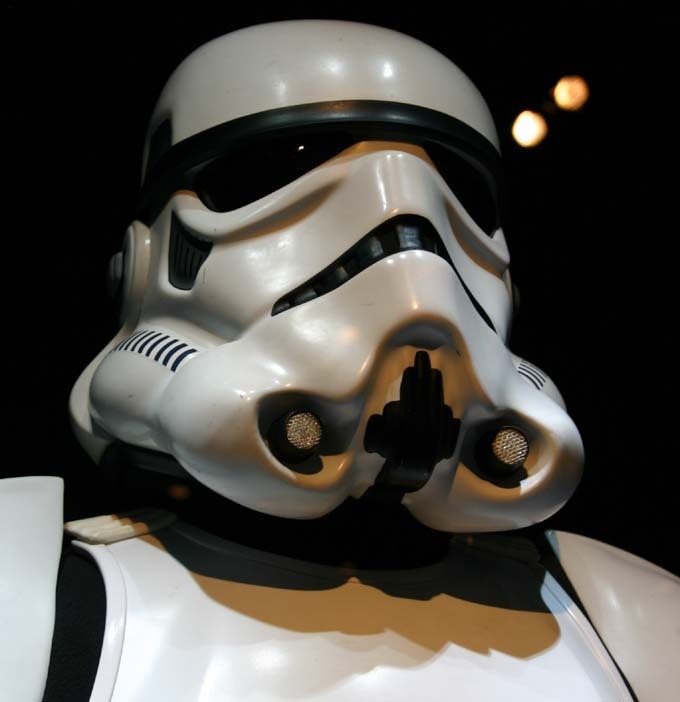 Unlike the popular myth, the suits were not made for the Special Editions, although many of the Stormtroopers were used in some of the scenes for extra filming, as the many original suits were in bad shape. 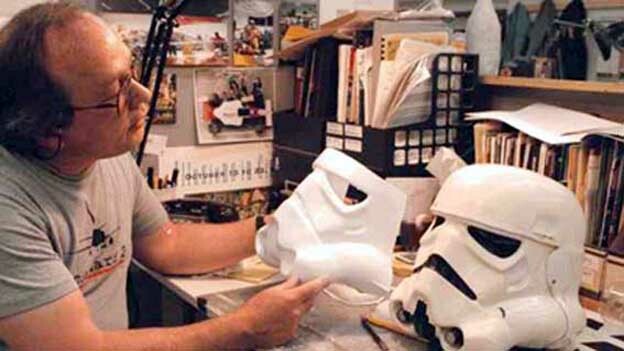 The ILM model shop, under the guidance of Charlie Bailey, made the Stormtroopers, and I believe they were created using styrene. 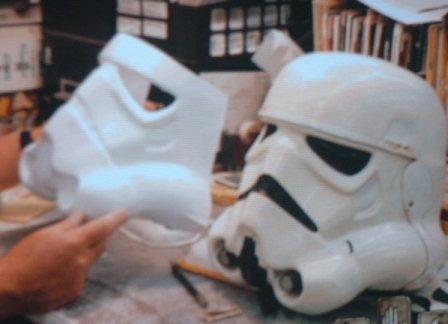 The molds were fabricated by pouring plaster into existing parts (ESB or RotJ era suits), and cleaned up here and there--though many parts are not as sharp as their originals. Additionally, some smaller patterns were created new, such as belt and knee details. They also molded prop guns to go with the characters out of urethane. 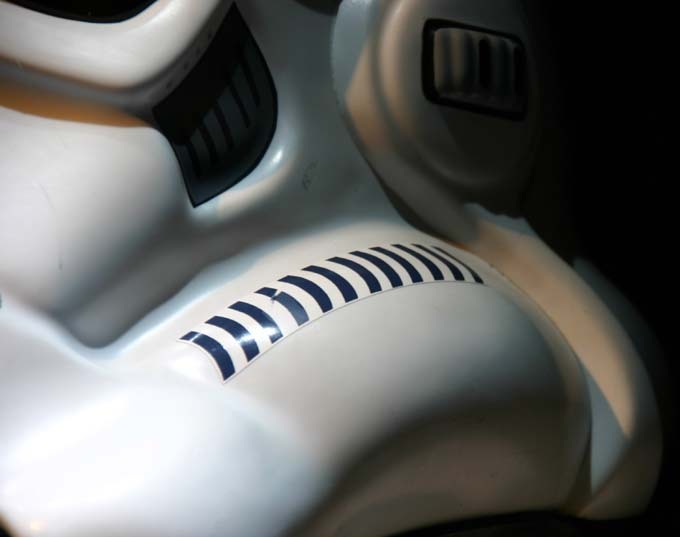 The Vader's were created by my wife and I under our company banner (at the time) of DNA Productions. 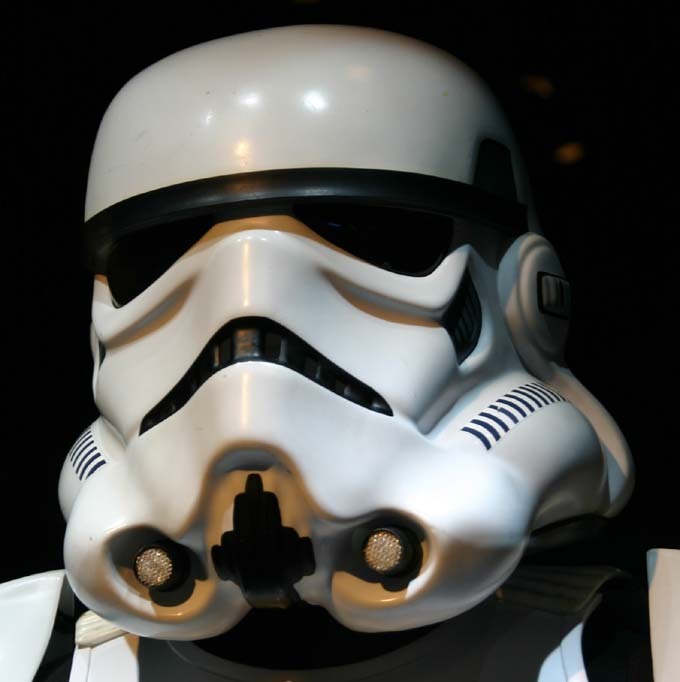 The mask was cast in fiberglass, and the helmets and chest control boxes were vacuum-formed black styrene. Urethane details were cast to dress the control box, and stock electrical project boxes were used for the belt details. Grant Imahara of Mythbusters fame provided a digital "breathing" soundbox, as well as blinking electronics. The suits were made of fake leather (pleather? ),as the budget would not allow anything higher quality. 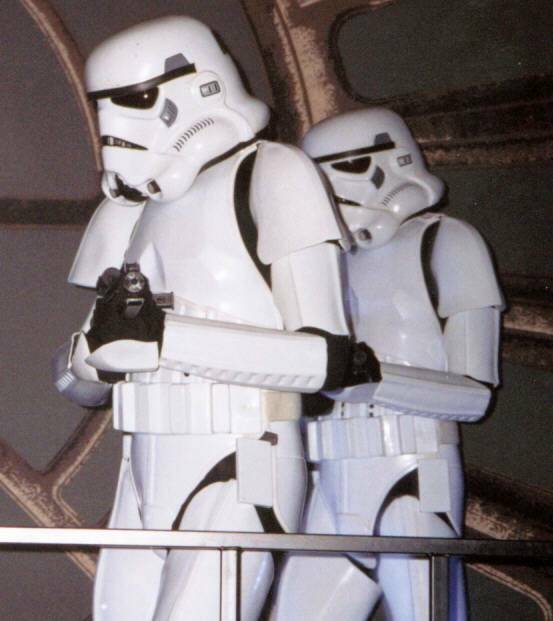 Below are a couple of nice photos from Scott - TK7602 of a RotJ Tour suit taken at a recent exhibition. You can tell they're Tour helmets as there are a couple of subtle "give-aways"
More Tour Suits following, this time from the London Barbican exhibition a few years back. Above and below some shots from the MOM Exhibition in London. 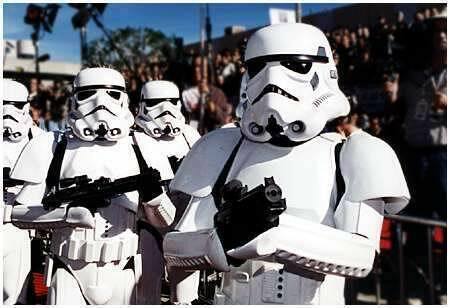 Note that the belts on the "real Troopers" at the back are made of fabric and can clearly be seen from these shots. Thanks to Drewski for these photo's.